Bornholm ([bɒːnˈhʌlˀm]; Old Norse: Burgundaholmr) is a Danish island in the Baltic Sea, to the east of the rest of Denmark, south of Sweden, northeast of Germany and north of the westernmost part of Poland. The main industries on the island include, dairy farming, and arts and crafts such as glass production and pottery using locally worked clay. Tourism is important during the summer. There is an especially large number of Denmark's round churches on the island. The total area according to www.noegletal.dk (Municipal and Regional Key Figures) was 588.36 square kilometres (227.17 sq mi) (January 2016). Population was 39,664 (1 April 2017). The island is called solskinsøen (The Sunshine Island) because of its weather and klippeøen (The Rock Island) because of its geology, which consists of granite, except along the southern coast. The heat from the summer is stored in the rock formations and the weather is quite warm until October. As a result of the climate, a local variety of the common fig, known as Bornholm's Diamond, can grow locally on the island. The island's topography consists of dramatic rock formations in the north (unlike the rest of Denmark, which is mostly gentle rolling hills) sloping down towards pine and deciduous forests (greatly affected by storms in the 1950s), farmland in the middle and sandy beaches in the south. Strategically located in the Baltic Sea, Bornholm has been fought over for centuries. It has usually been ruled by Denmark, but also by Lübeck and Sweden. The ruin of Hammershus, at the northwestern tip of the island, is the largest medieval fortress in northern Europe, testament to the importance of its location. Bornholm Regional Municipality, established January 2003 by the merger of Bornholm County with 5 municipalities, covers the entire island. Bornholm was one of the three last Danish municipalities (Danish: (singular) kommune; kommuner (plural)) not belonging to a county — the others were Copenhagen and Frederiksberg. On 1 January 2007, the municipality lost its short-lived (2003 until 2006) county status and became part of the Capital Region of Denmark. The municipality's educational needs are served by the Bornholms Erhvervsskole, the main educational institute on the island. The island is situated between 54°59'11" and 55°17'30" northern latitude and 14°45' and 15°11' eastern longitude. Directly west of Bornholm across the Baltic Sea mostly on the island of Sjælland are several municipalities of Region Sjælland: Stevns, Faxe, Næstved (the part that used to be the municipality of Fladså) and Vordingborg, including Møn, which is around 135 kilometres (84 miles) across the Baltic Sea. It typically takes 3 hours for passengers and freight (ferry :2 hours; driving :1 hour) to travel between Rønne and Copenhagen via Ystad in Sweden. There is a ferry departure mostly reserved for freight of goods between Rønne and Køge. If there is capacity on a departure, "normal" passengers can come aboard. There are also ferry routes to Sassnitz and Świnoujście. Between Bornholm Airport and Copenhagen Airport by airplane it is 25 minutes. The Ertholmene archipelago is located 18 kilometres (11 miles) to the northeast of Bornholm. These islands, which do not belong to a municipality or region, are administered by the Danish Ministry of Defence. Bornholm Regional Municipality is the local authority (Danish, kommune) covering the entire island. It is the result of a merger of the five former (1 April 1970 until 2002) municipalities on the island (Allinge-Gudhjem, Hasle, Nexø, Rønne and Aakirkeby) and the former Bornholm County. Bornholm Regional Municipality was also a county in its own right during its first four years from 1 January 2003 until 31 December 2006. From 1 January 2007 all counties were abolished, and Bornholm became part of Region Hovedstaden whose main responsibility is the health service. The municipality still retains its name Bornholm Regional Municipality. 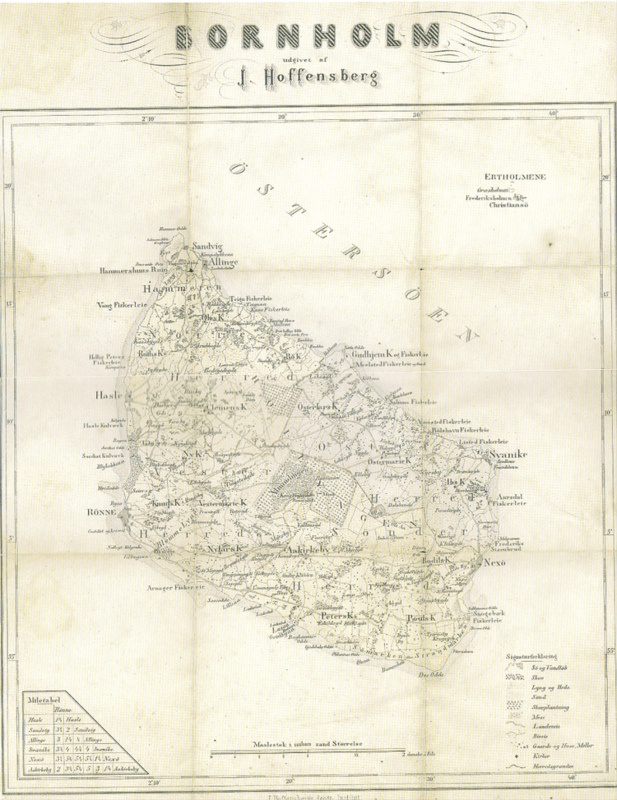 The island had 22 municipalities until March 1970, of which 6 were market towns and 16 parishes. In addition to supervising parish municipalities, which was the responsibility of the counties in all of Denmark, the market town municipalities of Bornholm were supervised by Bornholm County as well and not by the Interior Ministry as was the case in the rest of Denmark. The seat of the municipal council is the island's main town, Rønne. The voters decided to merge the county with the municipalities in a referendum May 29, 2001, effective from January 1, 2003. On the ballot was written the question, "Do you want the six municipal entities of Bornholm to be joined to form one municipal entity as of 1 January 2003?" 73.9% of those voting ticked off the box "Ja" (English, Yes) on the ballot. The lowest percentage for the merger was in Nexø municipality, whose mayor, Annelise Molin, a Social Democrat, spoke out against the merger. It was required that each municipality had more "Yes" votes than "No" votes. Otherwise the merger would have to be abandoned altogether. The six municipal entities had 122 councillors (of which county clls were 15) and the new regional municipality would have 27 councillors from the start. They will be reduced to 23 from 1 January 2018 (election November 2017). The merger was approved in a law by the Folketing 19 March 2002, transferring the tasks of the abolished county and old municipalities to the new Bornholm Regional Municipality. The first regional mayor was Thomas Thors, a physician and member of the Social Democrats and previously mayor of Rønne Municipality. Bjarne Kristiansen, representing the local Borgerlisten political party, served as mayor from January 1, 2006 until 2009. From January 1, 2010 the mayor has been Winni Grosbøll, a high school teacher and a member of the Social Democrats (Socialdemokratiet) political party. The larger towns on the island are located on the coast and have harbours. There is however one exception, centrally placed Aakirkeby, which was also the name of the municipality from 1970 until 2002, which also included the harbor, Boderne, 5 kilometres (3.1 miles) to the south. The largest town is Rønne, the seat, in the southwest. The other main towns (clockwise round the island) are Hasle, Allinge-Sandvig, Gudhjem, Svaneke and Nexø. Monday morning 22 September 2014 it was documented by Folkeregistret in the municipality that the number of people living in the municipality that day were 39,922, the lowest number in over 100 years. The town of Rønne after the merger of the island's administrative entities 1 January 2003 reached a low point of 13568 inhabitants 1 January 2014. 15957 people in 1965 (date unknown;number not registerbased) lived in the two parishes that would become Rønne municipality from 1 April 1970. In the table, numbers for Rønne are for the parish of Rønne, Rønne Sogn, alone. Year unknown. It does not include Knudsker Sogn, which was also a part of Rønne Municipality. Other localities (with approximate populations, not updated) include Aarsballe (86), Arnager (151), Olsker (67), Rutsker (64), Rø (181), Stenseby (?) and Vang (92). 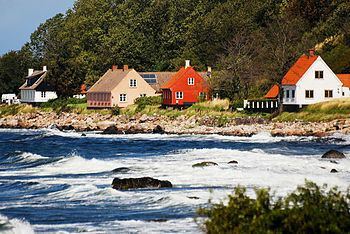 Bornholm also attracted many famous artists at the beginning of the 20th century, forming a group now known as the Bornholm school of painters. 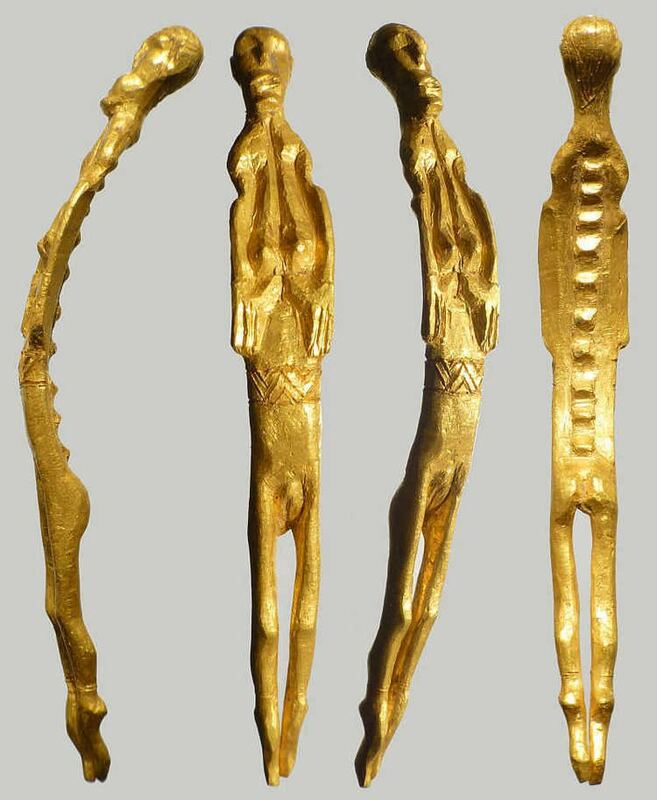 In addition to Oluf Høst, they include Karl Isaksson (1878–1922), from Sweden, and the Danes Edvard Weie (1879-1943), Olaf Rude (1886–1957), Niels Lergaard (1893–1982), and Kræsten Iversen (1886–1955). Bornholm, as a part of Denmark, was captured by Germany on 10 April 1940, and served as a lookout post and listening station during the war, as it was a part of the Eastern Front. The island's perfect central position in the Baltic Sea meant that it was an important "natural fortress" between Germany and Sweden, effectively keeping submarines and destroyers away from Nazi-occupied waters. Several concrete coastal installations were built during the war, and several coastal batteries had tremendous range. However, none of them were ever used, and only a single test shot was fired during the occupation. These remnants of Nazi rule have since fallen into disrepair and are mostly regarded today as historical curiosities. Many tourists visit the ruins each year, however, providing supplemental income to the tourist industry. Bornholm was heavily bombarded by the Soviet Air Force in May 1945. German garrison commander, German Navy Captain Gerhard von Kamptz, refused to surrender to the Soviets, as his orders were to surrender to the Western Allies. The Germans sent several telegrams to Copenhagen requesting that at least one British soldier should be transferred to Bornholm, so that the Germans could surrender to the western allied forces instead of the Soviets. When von Kamptz failed to provide a written capitulation as demanded by the Soviet commanders, Soviet aircraft relentlessly bombed and destroyed more than 800 civilian houses in Rønne and Nexø and seriously damaged roughly 3,000 more on 7–8 May 1945. In the mid 1940s Donald (descendant of Ben Sayers) and Mavis Sayers arrived in Bornholm on a boat from Copenhagen. On their arrival they were greeted by a band and were paraded into the town centre. They were celebrated by the locals as the first English people to visit Bornholm since the end of the war and were treated like royalty during their stay. Following their stay they were frequently invited back as they were seen as a symbol of the restoration of Bornholm. After the evacuation of their forces from Bornholm, the Soviets took the position that the stationing of foreign troops on Bornholm would be considered a declaration of war against the Soviet Union, and that Denmark should keep troops on it at all times to protect it from such foreign aggression. This policy remained in force after NATO was formed, with Denmark as a founding member. The Soviets accepted the stationing there of Danish troops, which were part of NATO but viewed as militarily inferior elements of the alliance, but they strongly objected to the presence of other NATO troops on Bornholm, in particular of US troops. On the surface of Bornholm older geological formations can be seen better than in the rest of Denmark. Stubbeløkken - which is still operating (Danish i drift) - and Klippeløkken granite quarries in Knudsker parish just east of central Rønne - and statistically a part of the town - are among the few remaining quarries of what was once many active quarries on the island. The island's varied geography and seascapes attract visitors to its many beauty spots from the Hammeren promontory in the northwest to the Almindingen forest in the centre and the Dueodde beaches in the southeast. Of special interest are the rocky sea cliffs at Jons Kapel and Helligdomsklipperne, the varied topography of Paradisbakkerne and rift valleys such as Ekkodalen and Døndalen. Bornholm's numerous windmills include the post mill of Egeby and the well-kept Dutch mill at Aarsdale. The lighthouse at Dueodde is Denmark's tallest, while Hammeren Lighthouse stands at a height of 85 metres (279 ft) above sea level and Rønne Lighthouse rises over the waterfront. M.P. Möller (1854 in Østermarie – 1937), a pipe-organ builder and manufacturer, moved to the USA in 1872. Pia Ranslet (born 1956 in Allinge) painter and sculptor.